Take your Sims on a mysterious adventure into the wild and discover a new culture with The Sims 4 Jungle Adventure. Explore a unique wilderness landscape, revealing a temple, jungle obstacles, cursed relics and treasures. Experience the culture and customs of Selvadorada, from devouring local eats to learning spicy new dance moves! 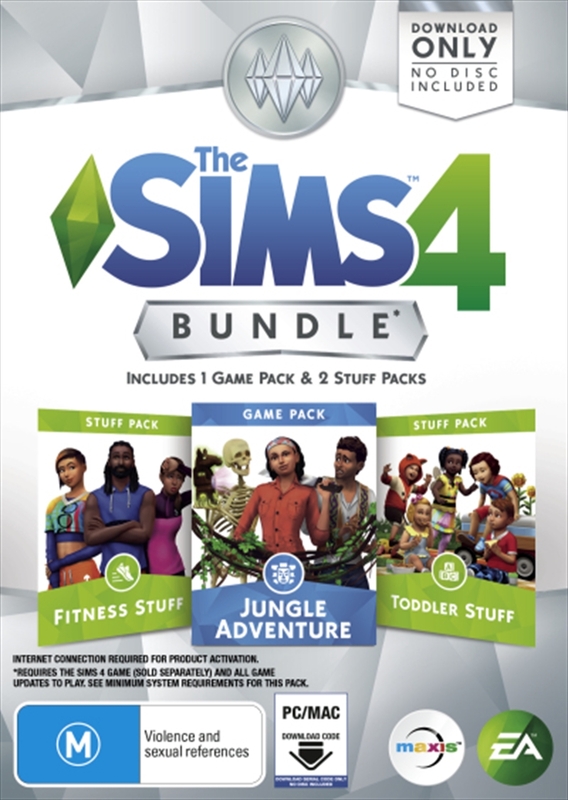 Elevate your Sim's fitness and embody an active lifestyle with The Sims 4 Fitness Stuff. Challenge your Sims to scale the rock climbing treadmill as a fun way to burn energy and improve their physique. Choose from a collection of fashionable activewear, and decorate your Sim's home with nature-inspired objects and decor. Give your toddlers new ways to express their personalities, burn off energy, and make friends with The Sims 4 Toddler Stuff. Dress your little Sims in a variety of adorable outfits and cute hairstyles. Use colorful decor to build an outdoor play space where toddlers can enjoy the slide, crawling tunnels, and ball pit with friends.